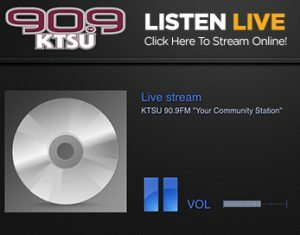 KTSU 90.9 FM is a public radio station that educates, inspires, entertains, informs, elevates, empowers and unites our community. Its mission is to deliver a unique blend of music, news and public affairs that honor the station’s core values and serve the community. •	Minimum Clutter - By airing a limited number of announcements per hour your message receives listener attention. •	High Time Spent Listening - Your message is heard because our listeners stay tuned for longer periods of time. •	Underwriter Satisfaction - 80% of listeners prefer to buy products from public radio sponsors, when price and quality are equal - 84% of underwriters say public radio has met their marketing expectations. •	Halo Effect - Underwriting enhances image, projects quality, credibility and stability resulting in listeners being more apt to learn more about and do business with the underwriter. KTSU can help you create a strong, meaningful connection with educated, influential and engaged listeners in Houston and surrounding areas. Your business can expand by becoming a station underwriter. Our audience will receive your distinctive message and learn more about your company. Your brand will be broadcast to an array of listeners by an uncluttered media environment and available only on public radio. Underwriting is a specialized, efficient opportunity for businesses eager to target people who value education and are interested in their communities and quality-of-life issues. It is an excellent, non-commercial avenue to help preserve music and our rich culture. KTSU is also a training ground for communication students at Texas Southern University. A station underwriter gets a once-in-a-lifetime opportunity to have a positive impact on young lives and the community at-large. Get on board, get on the KTSU airwaves and let’s grow together! Contact our Development staff at 713-313-1021 for more information.